While I was going through my file to determine what else I can plan for Konda’s lunch. Off late it has become kind a routine. Then I was going through the menu ideas that my GDM friends shared, one of them mentioned they do these pakodas. Well how very interesting I thought. Because one would always associate these to be served as snack or for evening tiffin. Now why would a kid say no for such delightful dishes being packed for lunch. I was so happy when Konda came back to say not only she loved it, her friends enjoyed it too. Guess she didn’t get to eat much of it herself. I made a note to self that I should pack more of such stuff. 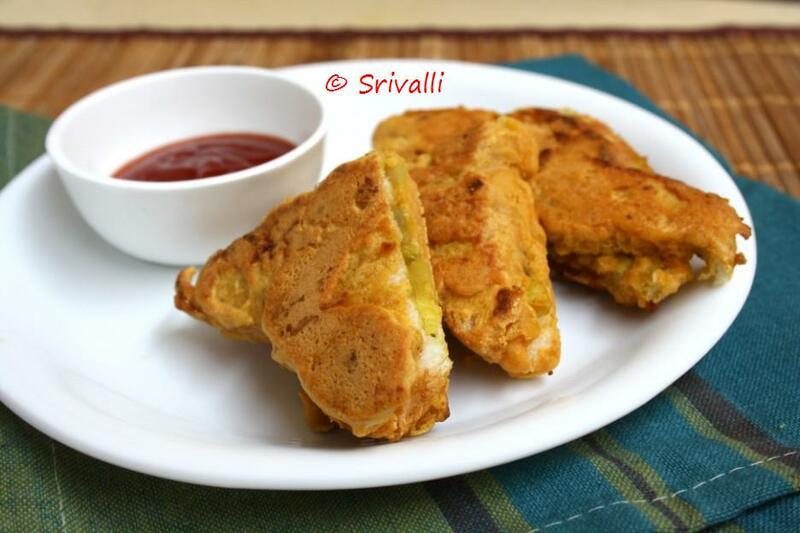 I remember Amma making Bread Pakodas, funny how I never came around posting our yummy Bread pakodas. When Amma gets to make Pakodas, she has an array of vegetables and other things for pakodas, bread being an integral part of it. Interesting how stuffing this makes it so delicious for kids. To make it more healthy, I pan fried these pakodas, though two were deep fried. Bread absorbs so much oil that it’s just so hideous. And shallow fried pakodas tasted just as well. Press the other one on top and press well for it to get sealed. Diagonally cut the bread and spread the besan batter on top. Grease a pan and cook on both sides. Take the flour, salt, chili powder and soda in a bowl. Add required water to get a thick batter. Heat a pan with 1 tsp oil. Place the pakodas and cook on low flame for it to get done. Flip on the other side and cook till it is done. Such a yummy snack. Spreading aloo filling is very interesting. Shallow frying makes them low fat too. Will try them soon. Enjoy ur Sunday. And fried bread with potato, that's double good! Delicious snack! I would love them in my lunch box!! 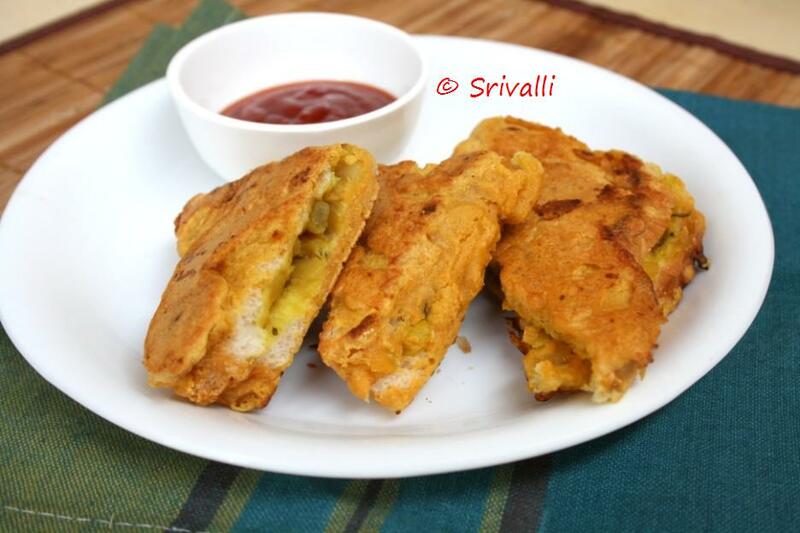 You can even put this bread with aloo stuffing in a sandwich maker and they would taste great!! Delicious!!! Potato Stuffing makes it even more tasty!!!! My mouth is watering it looks yummy and crunchy . 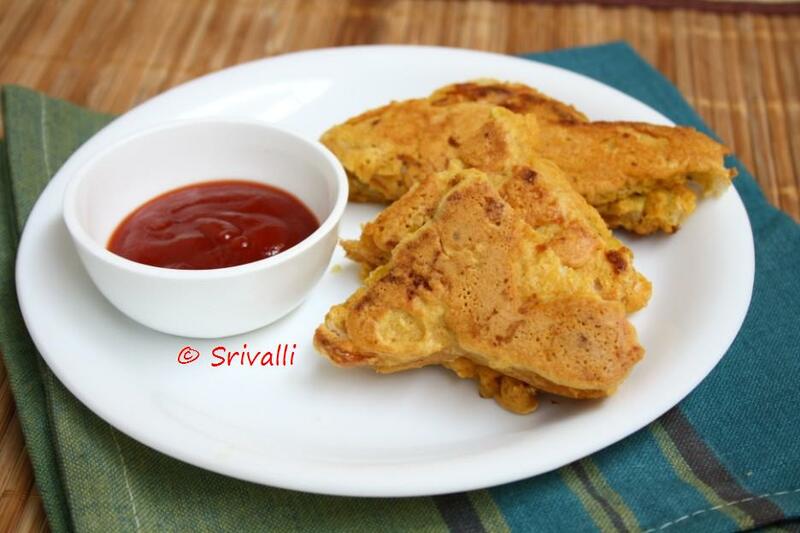 very nicely done Srivalli….shallow frying these is the best!…Kids surely will love it! This is nice idea. I do with a semolina coating too. I love bread pokoras….yours look divine.